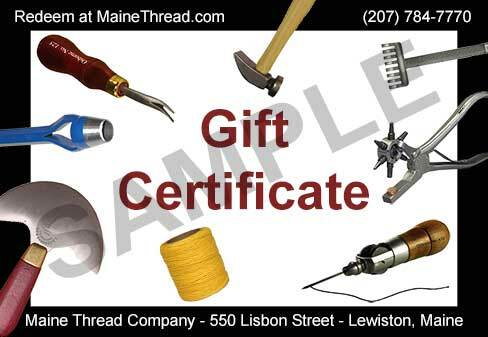 Thanks for your speedy shipment and having what we need to make our moccasins...right here in Maine, too. Very nice purchase for me. Inserted blade after sizing the hole on the haft. Work very well and saved a little cash. Maine Thread is a great place to trade. Very helpful. I ordered Black waxed thread (.030") and an awl haft on a Thursday and my order arrived the next Tuesday, which I felt was a bit slow, since they are only a 2 hour drive from my house. The thread, though, is pretty good. It is waxed and works great for leather. It is very strong, even though I ordered a light weight. The thickness is uniform and it looks very nice when hand stitched. The thread is lightly waxed so there is no problems with wax build up from pulling it through the tight holes, Although, on longer seams, you need to rewax the ends to keep them from unraveling and pulling from the needles, which is typical and not an issue. The price was reasonable and they also sent a sample (a full spool) of zebra thread at no charge. In summary, The thread was very high quality and worked perfect for my purpose ( motorcycle seat). This was my first order from Mainethread, but I will definitely order from them again.